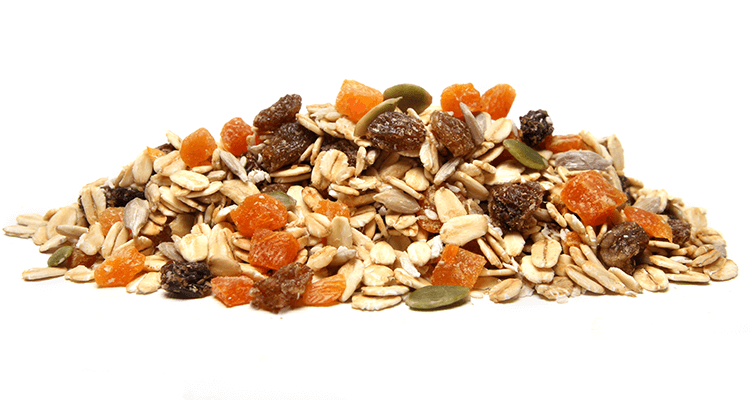 Traditional style muesli with no added sugar. Naturally sweetened with dried fruits and generously sprinkled with nutritious seeds. Wholegrain Oats, Dried Apricots (Apricots, Rice Flour, Preservative (Sulphur Dioxide)), Sultanas (Sultanas, Canola Oil), Raisins (Raisins, Sunflower Oil), Sunflower Seeds, Coconut (Coconut, Preservative (223 (contains Sulphites))), Sesame Seeds, Pumpkin Seeds. May contain pieces of shell or fruit pits. Contains gluten, sesame seeds and sulphites. May contain traces of egg, milk, peanuts, soy and tree nuts.